Goal. 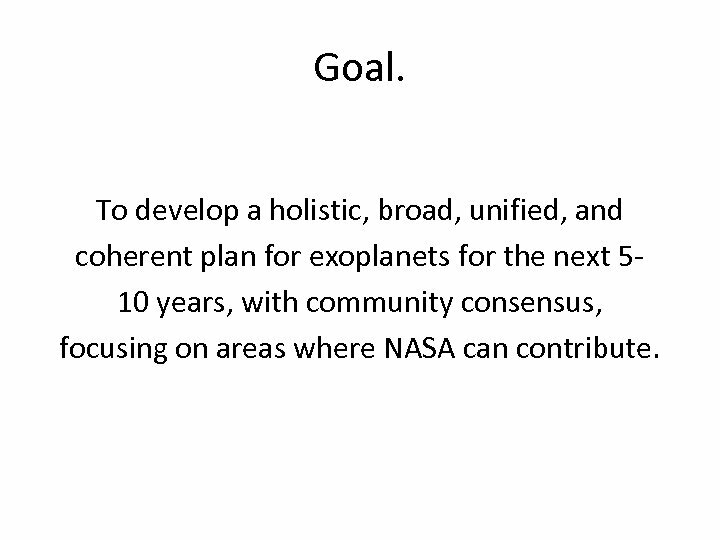 To develop a holistic, broad, unified, and coherent plan for exoplanets for the next 510 years, with community consensus, focusing on areas where NASA can contribute. Why? 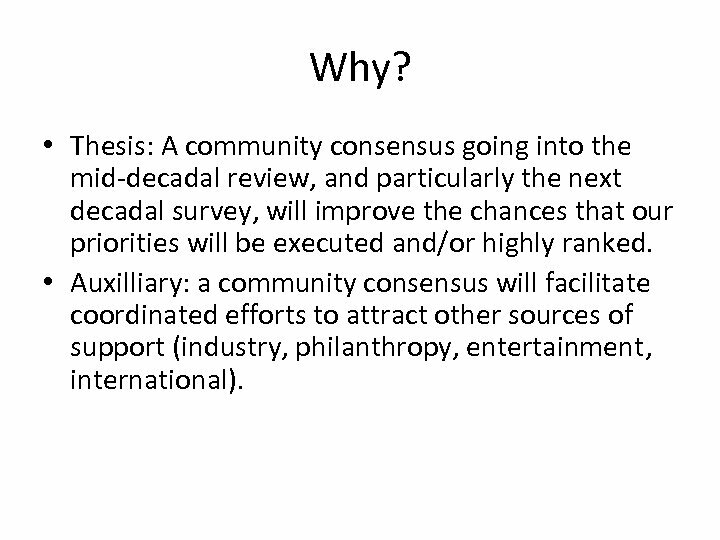 • Thesis: A community consensus going into the mid-decadal review, and particularly the next decadal survey, will improve the chances that our priorities will be executed and/or highly ranked. • Auxilliary: a community consensus will facilitate coordinated efforts to attract other sources of support (industry, philanthropy, entertainment, international). WFIRST+C Discussion at Exo. PAG 7. • Scheduled talk from David Spergel on AFTA, but… • Brief summary of AFTA SDT activities up to that point. 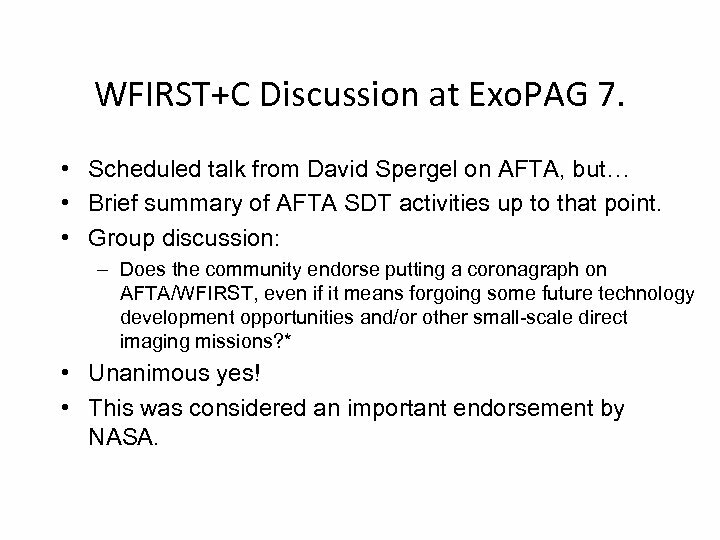 • Group discussion: – Does the community endorse putting a coronagraph on AFTA/WFIRST, even if it means forgoing some future technology development opportunities and/or other small-scale direct imaging missions? * • Unanimous yes! • This was considered an important endorsement by NASA. Hasn’t this been done many times? • Yes. 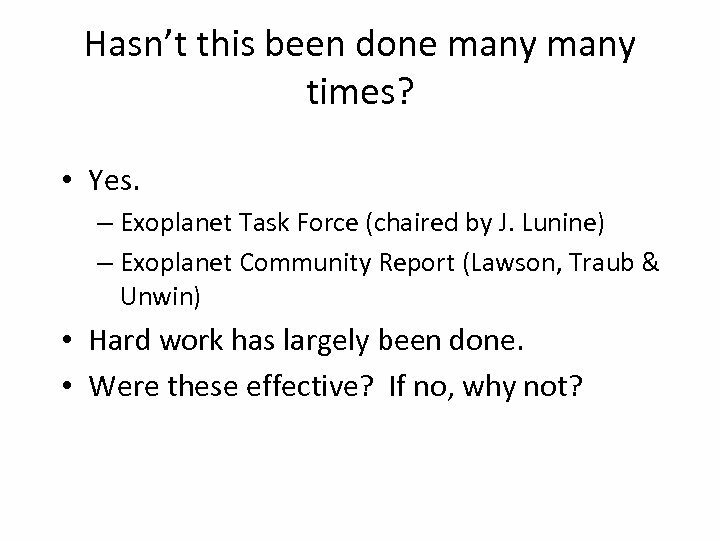 – Exoplanet Task Force (chaired by J. Lunine) – Exoplanet Community Report (Lawson, Traub & Unwin) • Hard work has largely been done. • Were these effective? If no, why not? 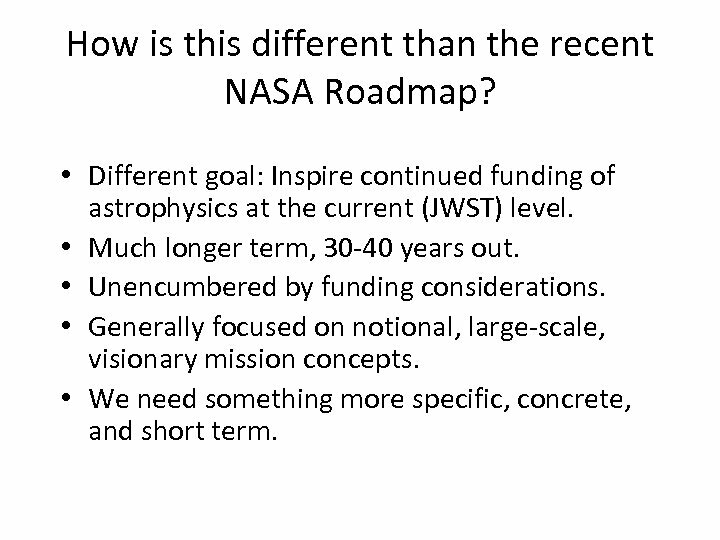 How is this different than the recent NASA Roadmap? • Different goal: Inspire continued funding of astrophysics at the current (JWST) level. • Much longer term, 30 -40 years out. • Unencumbered by funding considerations. • Generally focused on notional, large-scale, visionary mission concepts. • We need something more specific, concrete, and short term. Science of Exoplanets. 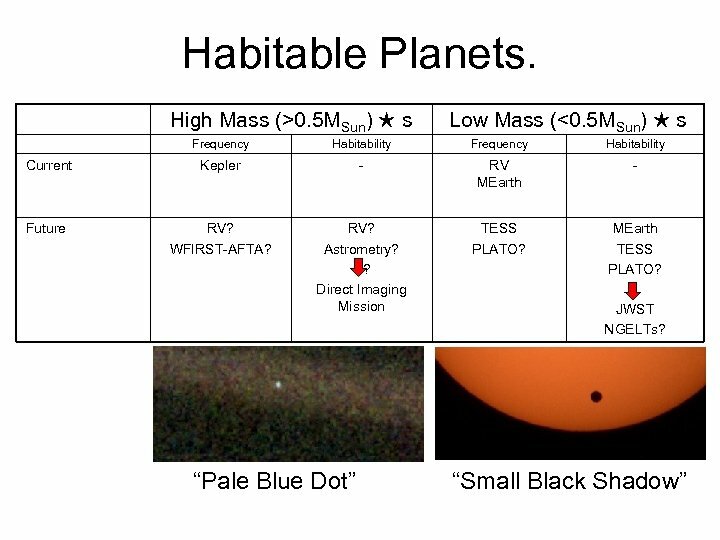 • Pale Blue Dots vs. Exoplanet Astrophyics. • Finding and characterizing a ‘pale blue dot’ remains a long-term goal. 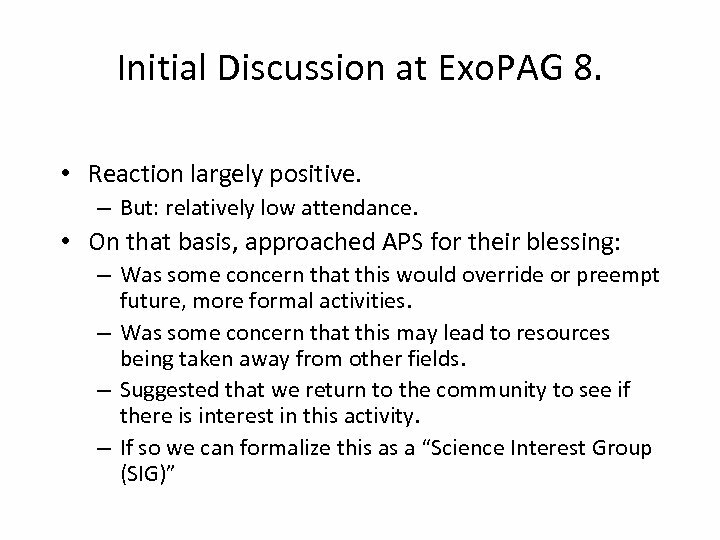 • But there are many other exoplanet science questions that we can and should address in the interim. • Many of these will likely bear directly on our understanding of habitable worlds – these are not disparate goals! 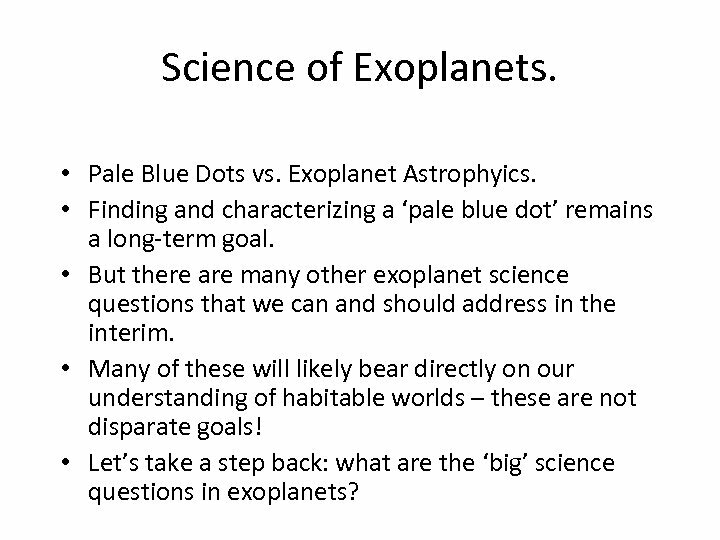 • Let’s take a step back: what are the ‘big’ science questions in exoplanets? 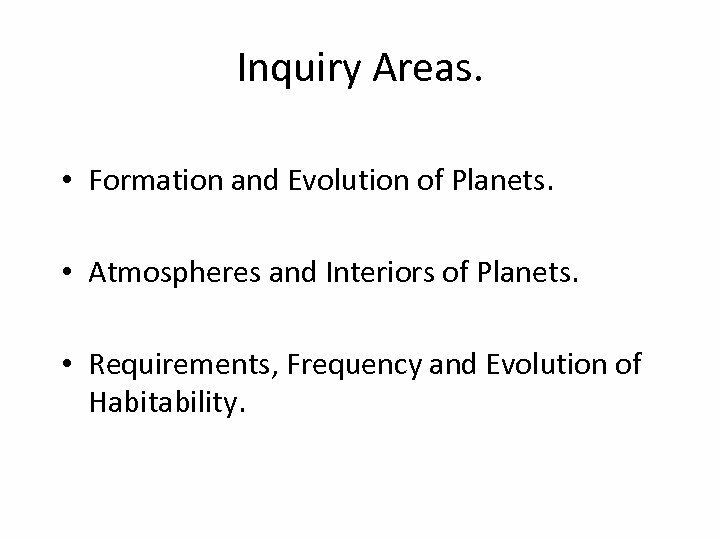 Inquiry Areas. • Formation and Evolution of Planets. • Atmospheres and Interiors of Planets. • Requirements, Frequency and Evolution of Habitability. Tools. • Demographics. • Characterization. 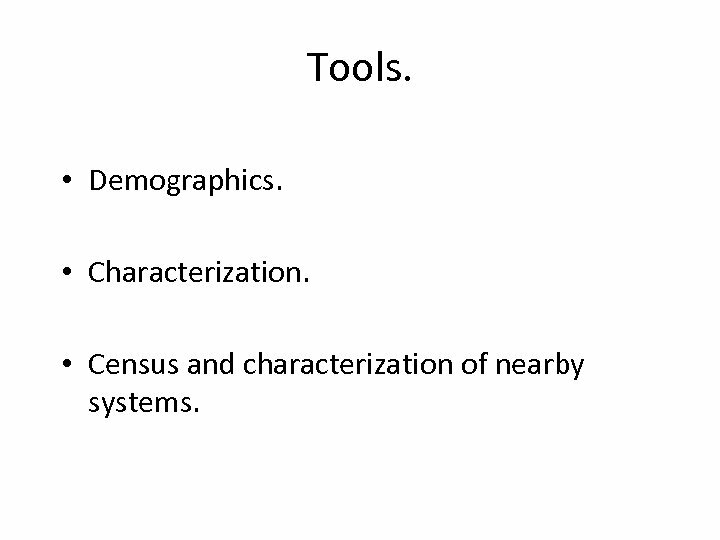 • Census and characterization of nearby systems. Goals. 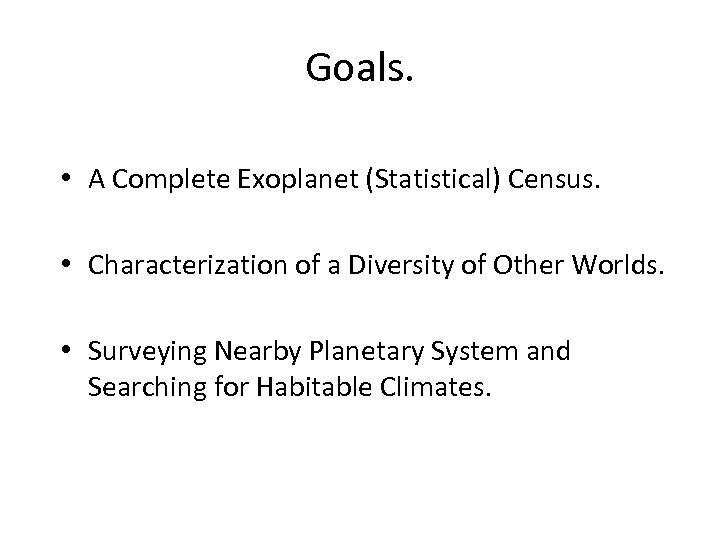 • A Complete Exoplanet (Statistical) Census. • Characterization of a Diversity of Other Worlds. • Surveying Nearby Planetary System and Searching for Habitable Climates. 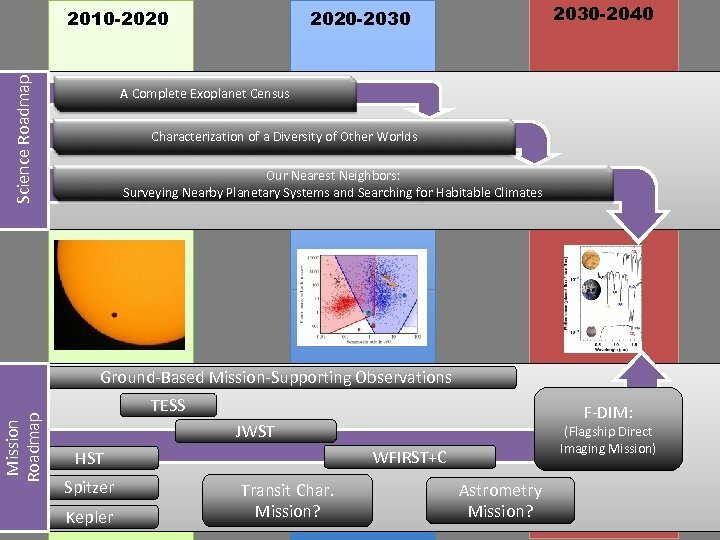 Science Roadmap 2010 -2020 2030 -2040 2020 -2030 A Complete Exoplanet Census Characterization of a Diversity of Other Worlds Our Nearest Neighbors: Surveying Nearby Planetary Systems and Searching for Habitable Climates Mission Roadmap Ground-Based Mission-Supporting Observations TESS F-DIM: JWST WFIRST+C HST Spitzer Kepler (Flagship Direct Imaging Mission) Transit Char. Mission? Astrometry Mission? 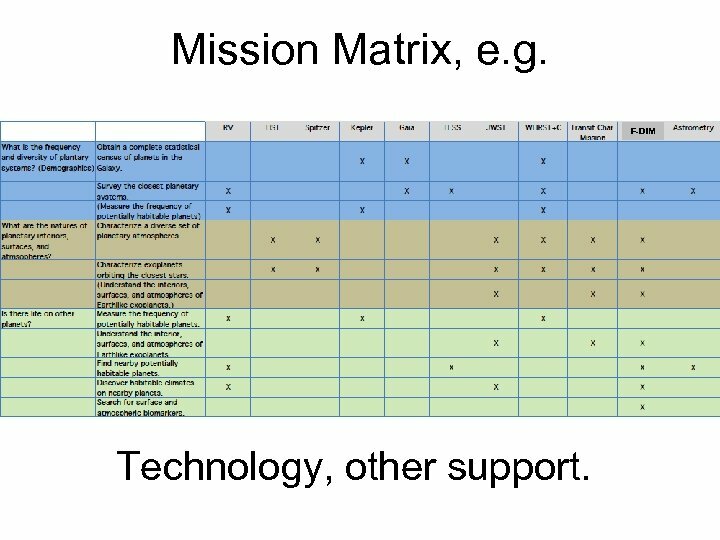 Mission Matrix, e. g. F-DIM Technology, other support. Some Open Questions. 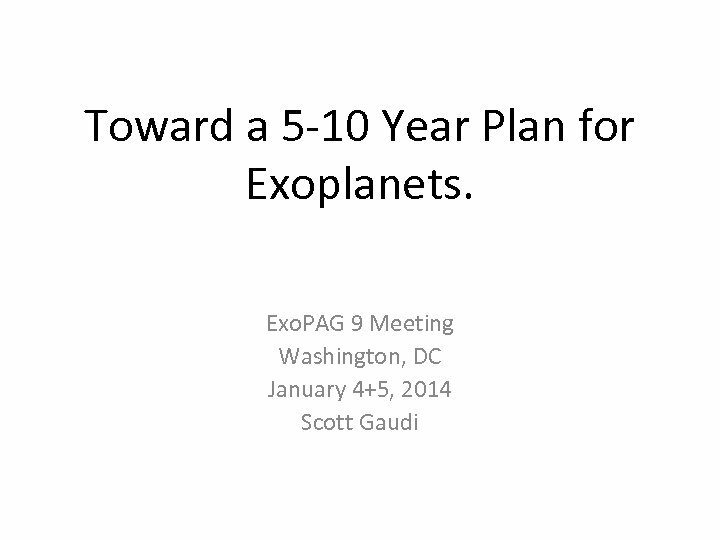 • Do we need additional capabilities for characterization of exoplanets? 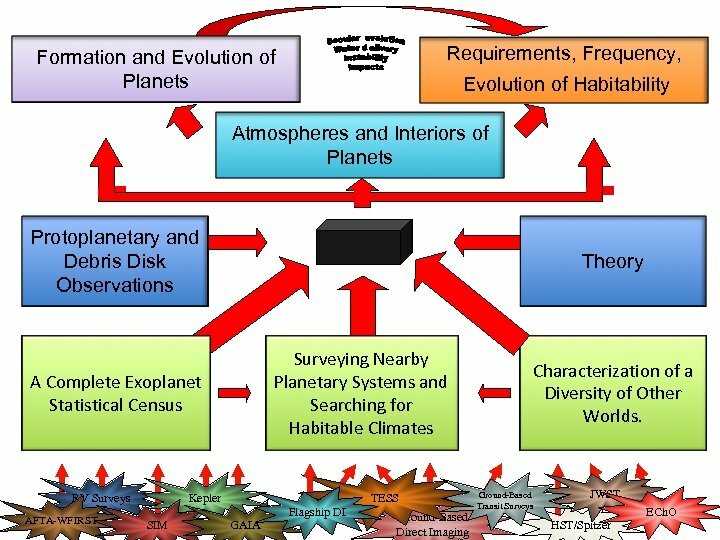 • How do we measure the masses of the nearby habitable planets? • What are the future roles of astrometry and interferometry? 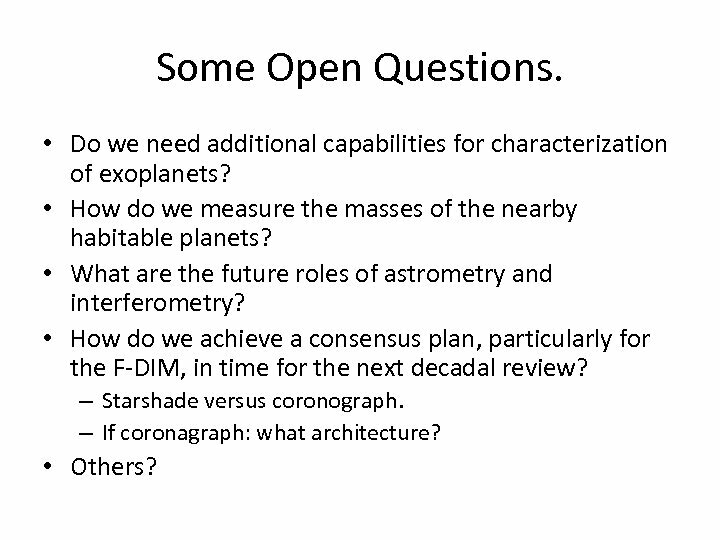 • How do we achieve a consensus plan, particularly for the F-DIM, in time for the next decadal review? – Starshade versus coronograph. – If coronagraph: what architecture? • Others?